I'm not a complete idiot. But my boss seems to think I am. Has that ever happened to you? Frankly, it's maddening. 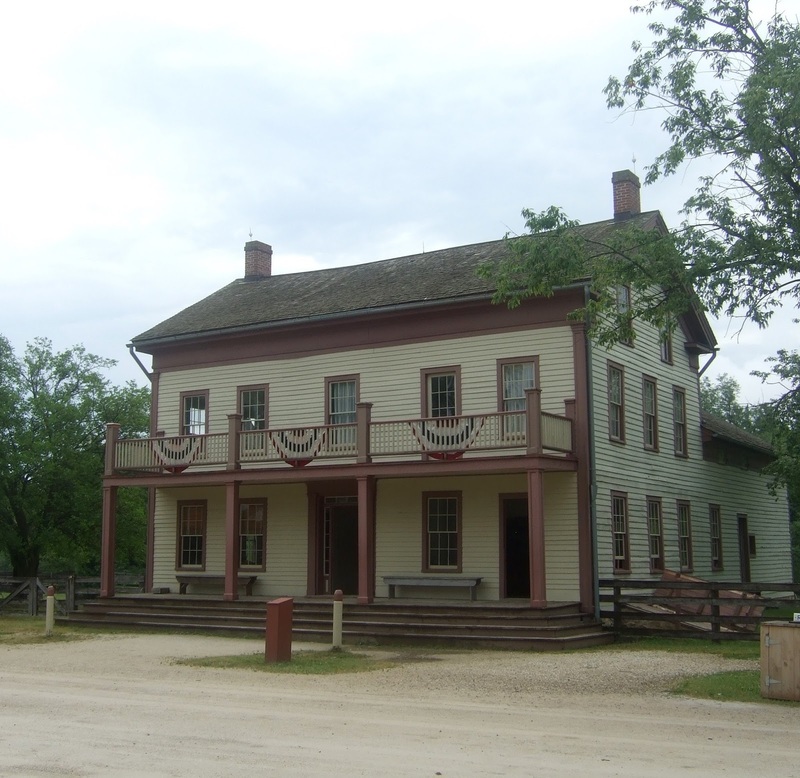 I work as a curator at Old World Wisconsin, a large historic site where over fifty historic structures have been restored and brought back to life by interpreters in period clothing. It's a wonderful place. The Kvaale Farm, home to Norwegian immigrants. The site is busy every day, but we occasionally have special events too. When my colleague Byron asked me to help plan and pull off the site's first Civil War reenactment, I was happy to agree. Byron and I were excited about the chance to focus on homefront activities. The Sanford Farm, in the Yankee area. 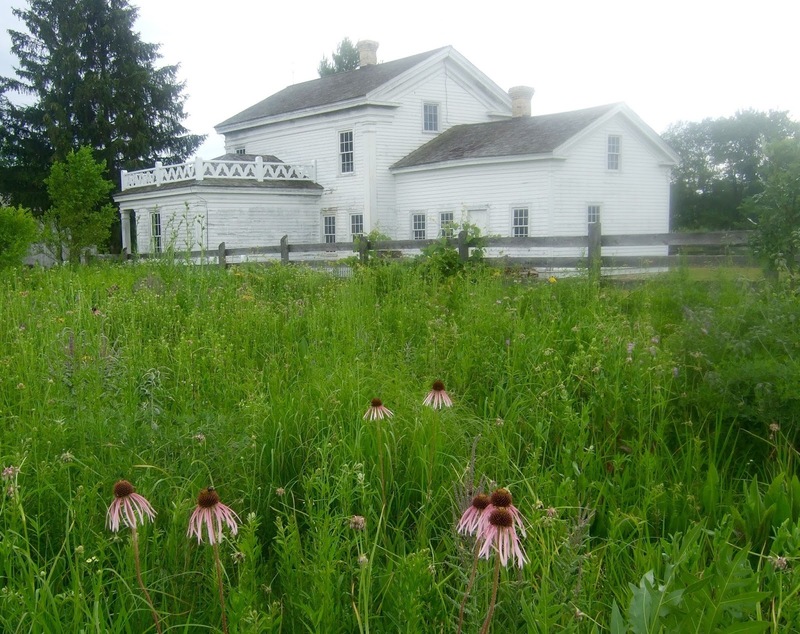 We have three farms that have been restored to the Civil War era, and a Crossroads Village---perfect for talking about things like recruitment, women's relief activities, and the draft. The Four Mile Inn--perfect for a recruitment rally. We were making plans when Ralph Petty, site director, announced he wanted to do a battle reenactment instead. Now, I love a good battle reenactment as much as anyone. But we have a rare opportunity to focus on social themes. Why not take advantage of it? So Byron and I are forging ahead despite Petty's threats of dismissal if our program is not an unequivocal (i.e., financial) success. Byron and I are committed to the event. But plans got derailed when an unidentified reenactor was found dead at the 1860 German farm. The Schulz Farm, where the poor man died. Now I'm trying to help the cops, trying to make plans for the reenactment, trying to supervise my new hyper-shy intern, trying to complete the make-work project Petty dumped on me as punishment for not agreeing with his perspective, and hoping I can get through the event without getting fired or finding any more dead reenactors. GIVEAWAY! Leave a comment below and you'll be in the running to win a signed and personalized copy of A Memory of Muskets. The giveaway ends at midnight on September 19th. Please include your email (ex., Jane.Doe -at- JaneDoe.com) so I can contact the winner. I can't wait to read this! Thanks for the chance. Your name's in the hat! I am a big fan of this series, particularly the road trips to Decorah and the Cities. I can't wait for the new one, Thanks so much for the chance to win! History (obviously) is one of my passions too. Good luck! I'm glad you enjoyed the post. You're entered! I'm pleased to know I piqued your interest! I enjoy historical related themes. thanks. Thanks, Mary! Sounds like we share some interests. Oh this should be a great read. When young, hubby was part of a civil war calvary group. Don't know that they did battle reenactments, but they held bivouacs, dressed in authentic costumes, carried sabers, rode, and trained. Always nice to hear from you, Cheryl! I hope you enjoy the next one too. I loved having a chance to reveal some of Roelke's family history this time. I'm retired now, so I fortunately don't have to worry about that boss thing! We went to a reenactment once and it was fascinating. 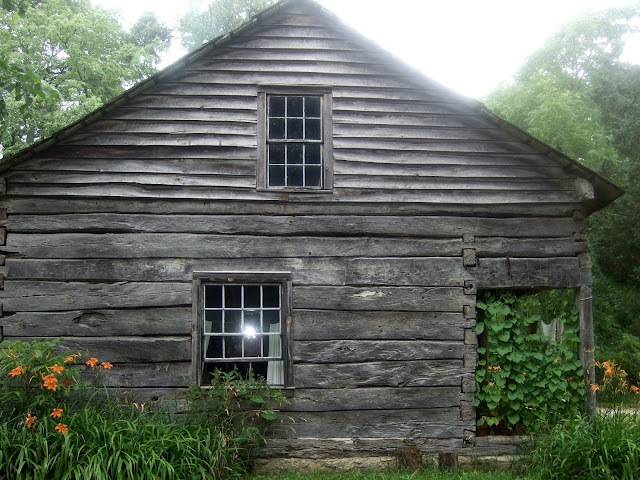 And growing up many trips to New Salem, Illinois with its recreations of the time Abraham Lincoln was there. Sounds like a good read, thanks fro the giveaway. Thank you for visiting and sharing and the chance to win. Awesome series! Another one I hope continues. You get to know characters like they are friends and look forward to finding out what's new with them. Well, you just made my day! Thank you. Thanks, Heidi! I'm delighted you're planning a trip. It's a special place. Glad you enjoyed the photos. Fingers crossed! Jana, the early planners managed to save some remarkable examples of early ethnic architecture. Even now I love to go and just walk the grounds, soaking it in. 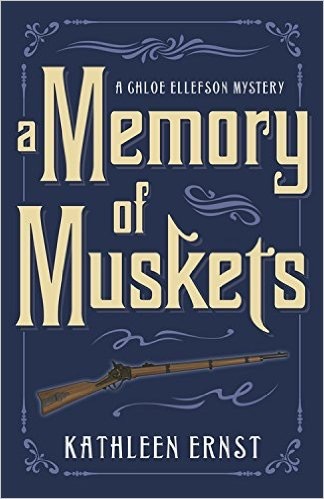 "A Memory of Muskets" sounds like a great read! I love historical fiction and would enjoy reading. Dianne, it sounds like we have some things in common. I loved historical fiction as a child, and that really set me on the path I'm following today. Readers make it possible to do what I love, and I'm grateful! You're in good company, Chloe; many years ago I had a boss much like Ralph. Thankfully I never found any dead bodies - though it wouldn't have surprised me to learn he had some buried in his back yard. (Snicker) I think we all, sooner or later, have a Ralph Petty in our lives. I'm really enjoying this series---I'd love to win this one. I'm very glad you're enjoying the series! Music to a writer's ears! I'm so glad! Fingers crossed. I'm so happy to have discovered this wonderful series, thanks in part to a program at the Mukwonago (WI) Library on April 11, 2015. Kathleen gave a fascinating presentation and I was able to have the first five books very graciously signed by Kathleen. I moved to Wisconsin in June of 2014 and have thoroughly enjoyed learning about WI history through Chloe's mysteries. Cheryl, I'm delighted that they've helped introduce Wisconsin to you. I'm a transplant too, and have been discovering great places and stories for over 30 years now. Hope to get back to Mukwonago some day! This series sounds very interesting. And I love history of old buildings. Thanks for telling us about a series I had never heard of before. My pleasure. Glad you're intrigued! Yikes, really? Very cool! The site has sure come a long way since the way-back days. I love looking at old pictures and being reminded of how raw the site once was. Betty, I love hearing that you can connect with Chloe, and that the books transport you there. Thank you! May it bring you some reading pleasure. Love your stories. Can't wait to see what awaits Chloe and Roelke next. Oh, thank you! And I'm already hard at work on their next adventure. I enjoy mysteries with a historical tie. Thanks for the opportunity to win. dbahn (at)iw(dot)net. We have some things in common, obviously! Thanks for dropping by. Thanks for giving it a try! Good luck. Kathleen, thank you for the intriguing plot lines and fascinating characters you always create for our enjoyment. Thank you, Kat. I love writing these books, and all my lovely readers make that possible! Chloe, hang tough! You have the right idea!! I look forward to reading more of your efforts. Fingers crossed, Kathleen! Very happy to hear you enjoy the Chloe series. I just returned from a week long trip as a volunteer with veterans to Gettysburg and Washington D.C. This really puts me in the mood to read your new book so I can tell Vesterheim visitors about it! Hi Sandy - ooh, perfect! That sounds like a special trip. Glad the timing works so well for you! (And a friend of mine said she was visiting Vesterheim and a very nice lady (sounds like you, but I know it also could have been others) in the gift shop recommended my books. Thank you as always for your support! It's hard not to get excited when I tell others about your books! Thanks, Kris! I just put together a new show, too. I won't be at Middleton library this fall, but hope to cross paths again sooner or later. Anxiously waiing to read a Memory of Muskets. Hope to get to one of your events. Thanks, LynMarie. I'd love to see you at an event! Connecting on FB is great, but nothing's better that in-person. Thanks for throwing your name in the hat. Hope you give the series a try! I hope you also enjoy Chloe and Roelke's next adventure, Libby! Great blog, we all understand trouble with the boss! Terrell, that does seem to be a universal, does it? on the job. I got to the point where I would listen and then after they left I'd chuckle to myself. Sounds like you handled things without losing your cool. Thanks for commenting! Can hardly wait for this, Kathleen! My book club can't wait for this next book in the series! Thanks Kathleen. That's wonderful! Love knowing that your book group will be sharing it. Thank you. I am loving this series and this book sounds wonderful. Mary Jane, I'm so happy to hear that you're enjoying the series. Your name is in the hat for the next installment! Kay, I was a reenactor for about 10 years, and loved it. It's an interesting hobby, isn't it? Thanks so much for this chance to win. This book sounds so exciting. My pleasure! Hope you give it a try. Tom, I learned to love history and historic places when I was little too, largely due to historical fiction. Your comment made me smile. why the long wait, and so fsr i haven't been able to order from my library ! hope soon,i want to be the first to order it ! Hi John - I've been having a Chloe book come out every fall, so actually publication is right on schedule. However, I do know that some library systems for whatever reason take a lo-o-ong time to get books into the system. Hope it comes in soon! Cannot wait! This is a fantastic series that I hope goes on for a very long time! The book sounds great! And I love the title! Thanks so much for the chance to win!!! My pleasure, Abby! Glad the post and the title were intriguing. As with every other, I can't wait to read this one! Thanks so much. Fingers crossed! Babies and books--sounds like a good combination to me. Glad you enjoyed the blog! Janet, I hope this brings back some good memories! My wife and I have enjoyed many reenactments over the years on our yearly vacations. They've even had them on Staten Island in NY. That's just over the bridge from where we live in Brooklyn. I'd love to be the lucky winner of this book and share it with our family. Many of whom prowl through my rather large home library looking for reading material. Love the image of family prowling through a large home library. Heck, I love the image of a large home library period! This sounds like an amazing book!!! I would love to read it!! !love books like this! Glad it sounds appealing, Mary! Sounds like a great read. But I love anything history and civil war. Thanks for the opportunity. We obviously have some interests in common! Love this series and cannot wait for the next!! Great for history lovers and mystery lovers alike! I'm so glad you enjoy the series! I love writing it. Just the thing (a new book to read) while laid up after surgery :) crossing my fingers! I hope your recovery goes quickly and smoothly! We obviously have a lot in common! Good luck. Congratulations to Patricia Parker, giveaway winner! Thanks so much to all who entered.